Our focus on logical reasoning has diminished our appreciation for the importance of emotions and intuition. Yet, intuition can be extremely powerful, provided you don't trust it blindly. 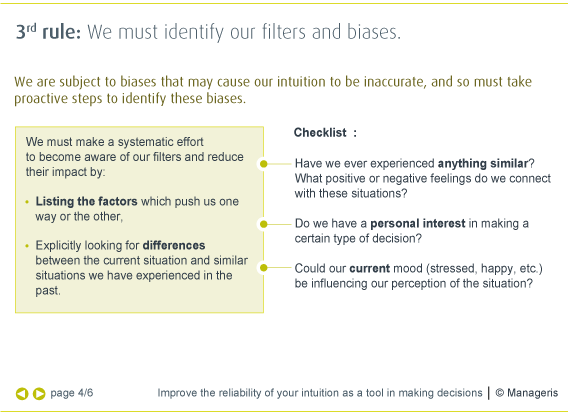 How to make your intuition more reliable? ¬ Contradictions, a source of innovation? What if we misunderstood Descartes? In defending the power of reason, we seem to have underestimated the importance of our feelings and intuition. However, Descartes had no intention of defending reason alone. He defined reason as “the power of good judgment; the ability to distinguish fact from fiction,” which, in his view, demanded two faculties—in-tuition and deduction. Indeed, decision-making experts have shown that intuition is an extremely powerful faculty, so long as we do not place blind faith in it. 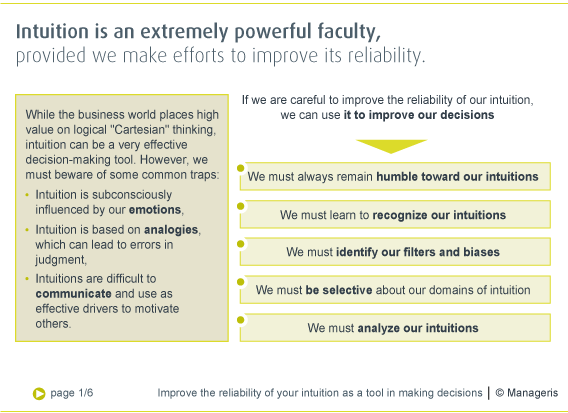 Our efforts to improve the reliability of our intuition are thus extremely valuable. In the world of business—especially big business—logical reasoning is unequivocally considered to be the most reliable way to make decisions. As a matter of fact, the ability to reason is one of the qualities most sought in future leaders. Business projects are studied, analyzed and presented methodically. In this context, a "Cartesian" mindset is supremely valuable. This powerful trust in reason masks a great wariness toward intuition, which would seem to give some the power to guess what others cannot see. Certainly, intuition can be misleading. 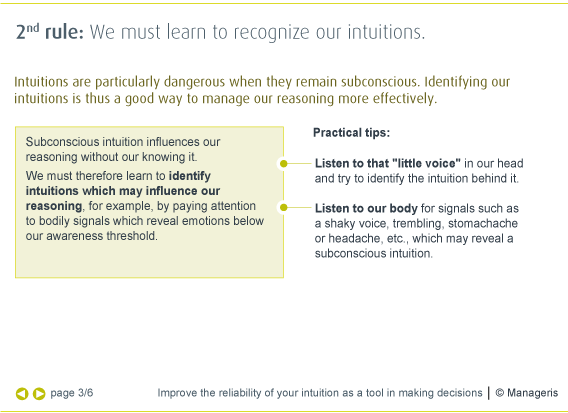 Many researchers and psychologists have discovered the numerous pitfalls of over-reliance on intuition. Intuition involves drawing analogies with situations we have already experienced. But these analogies may be inappropriate. When we use our intuition, we are actually interpreting a mass of indicators to give them meaning almost instantaneously. However, our subconscious may easily filter these indicators and lead us to erroneous conclusions. So, we are in for a lot of disappointments if we rely entirely on intuition. Yet, totally denying the power of intuition is just as risky. First of all, we are intuitive beings—that’s a fact. 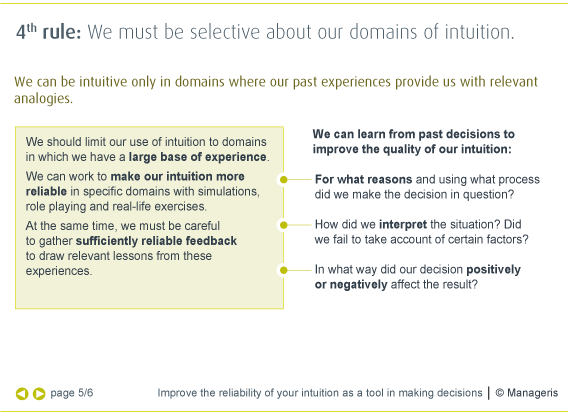 Even when we think we are casting intuition aside to be purely rational, intuition plays a subconscious role. For example, what do we do when a candidate for a key position corresponds to our criteria in every way, but we instinctively want to reject the person? The usual reaction is to take a closer look at our criteria or weightings and to adjust them. The author of “Intuition, Its Powers and Perils” underlines thus that there is an almost perfect correlation between the impression formed in the first fifteen seconds of a recruiting interview and the conclusions drawn after thirty minutes of methodical conversation. This certainly demonstrates the relative importance of intuition and reason in the process! If we refuse to recognize this influence, we delude ourselves about the reliability of our reasoning. Moreover, it would be a shame to deprive ourselves of such an extraordinarily powerful faculty as intuition. We must therefore learn to use our intuition with greater lucidity. 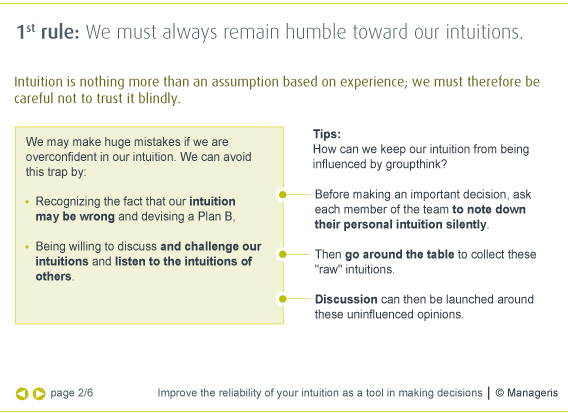 Better understand how intuition works in order to capitalize fully on it. A good book to learn more about the different facets of the ability called intuition and to enhance your knowledge of decision-making psychology.